Motionmaster 3 Axis CNC Router C576 - CNC Parts Dept., Inc.
March 25, 2019 by CNC Parts Dept. 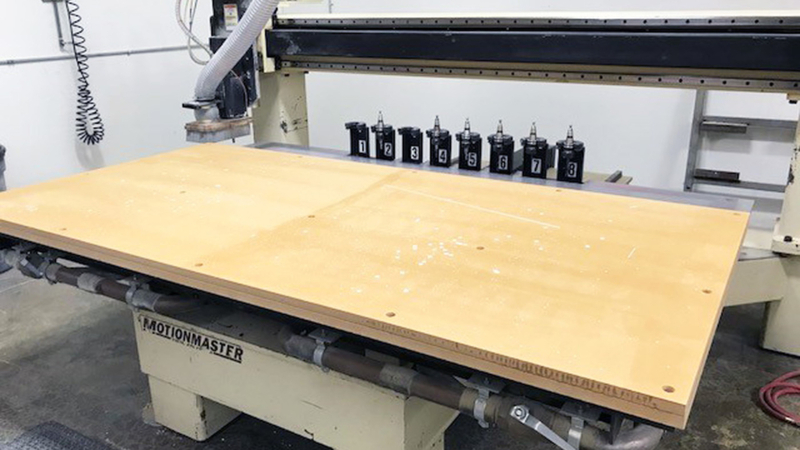 Used Motionmaster 3 axis CNC router for sale, equipped with single moving 8 ft. x 4 ft. two zone vacuum table, 5 hp vacuum pump, 7.4 inches of Z stroke, a 10 HP ATC HSD spindle motor, 8 position tool rack and controlled with Fagor 8055-B CNC Controller. This router is ready for inspection, contact us today for more information! To request a quote for this Motionmaster CNC router for sale, call us at (858) 922-4967 or send us a message on our website! CNC Parts Dept, Inc is a Fagor Automation world distributor. Our team of CNC experts can provide Fagor technical support, service and spare parts for this router! We offer FREE telephone troubleshooting support. Thank you so much for all the time and effort that you put into the selling of our Motionmaster! I am very impressed that the timing worked out perfectly and your sense of urgency to make this all happen on time – I was told you were a selling machine and you performed magically!